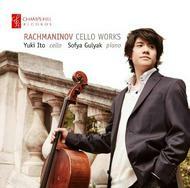 The music of Rachmaninov has been a source of great inspiration throughout Yuki Ito’s Life. A graduate of the Royal College of Music, London, Yuki Ito was born in Tokyo in 1989 and began playing the cello at the age of 6. This new recording for Champs Hill Records forms part of his prize for winning the UK’s highest profile gateway to string players - the Windsor Festival International String Competition. Rachmaninov composed his first piece for the cello in honour of Vera, the youngest of the Skalon sisters he had met while holidaying with family aged 17. One can hear in this short but ‘soulful’ little piece the earnestness of Rachmaninov’s intentions, originally titled Lied (the German term for an art song) but now more widely known as ‘Romance’. However, the affair was forcibly ended when Vera’s mother heard of the young couple’s habit of sitting together at dusk holding hands. Although talented, a rising young musician was thought a very poor match for a general’s daughter, and Rachmaninov was forbidden to contact to Vera again. Rachmaninov’s next cello work, the sweetly lyrical Prelude in F, was composed to be performed in his first public concert as a pianist-composer. After its premiere by himself and Brandukov, his long time friend, in 1892, the Prelude was repeated two years later coupled with the ‘Oriental Dance’. In 1895 Rachmaninov composed his First Symphony, a work considered by some to be the finest of his symphonic works. Rachmaninov followed this with his Op. 14 collection of songs, including ‘Spring Torrents’ (arranged for cello and piano in this recording by Yuki Ito): here we can hear a composer at the peak of his ability and ambition, writing some of the most impassioned and virtuosic piano accompaniment to be heard in his oeuvre as he portrays the exuberant and almost violent eruption of spring in Russia. Rachmaninov’s Sonata for Cello and Piano was composed immediately after completing his breakthrough Second Piano Concerto in 1901 and was originally completed in November that year. In character the Sonata shares much in common with the Concerto, such as the typically melancholic and soulful second theme of its first movement.